Good Cattle, Good People, Good Life!!! October 12, 2019 - "The Beginning is Now"
Pleasant Hill Farms has had registered Angus cattle since 1972. We began to really focus our concentration on herd improvement in 1990. We are a total performance herd with a focus on phenotype and genotype combined. We use production, maternal, carcass and value added EPDs. We make use of ultrasound carcass data, individual performance an d DNA test results. We also make use of ultrasound carcass data and individual performance. Carcass data from slaughtered progeny of our own sires is also a contributing factor in our selection process. Good old common sense is a major part of our selection criteria. An animal’s body condition score, calving interval and longevity are economically important traits that we pay close attention to. We strive to produce structurally and reproductively sound, efficient beef cattle that anyone would be proud to own. Our goal is to blend phenotypic, genetic and performance superiority into a product that will be sought after by purebred and commercial beef producers alike. We will provide the commercial beef cattle producer bulls that will sire calves that will come unassisted, hit the ground growing and will finish with a premium carcass. The sisters of these bulls will be herd builders for us and anyone else that might own them. In addition, our genetics will be desirable to our fellow purebred breeders and help them advance their respective operations. Pleasant Hill Farms is located in Rockfield, Kentucky about 6 miles southwest of Bowling Green, Kentucky and just one-half mile off US 68/80. 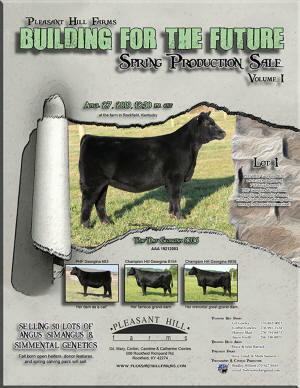 We presently are running about 50 spring calving registered Angus cows and about 50 fall calving registered Angus cows. We have a feeder calf alliance opportunity for Pleasant Hill bull sired calves. We usually send our calves in June and in November. If you have feeder calves sired by one of our bulls and want to find out more about this program, please just ask. Thank you for your interest in our Angus, SimAngus, and Simmental breeding program. We are committed to providing the highest quality of beef cattle seed stock that will have the greatest value to our customers. We look forward to working with you. If we can be of any assistance, please give us a call.